Comcast's switch from XFINITY TV to XFINITY Stream about a year ago was met with lots of criticism for a number of reasons, and based on the latest Google Store reviews, users still aren't very happy. 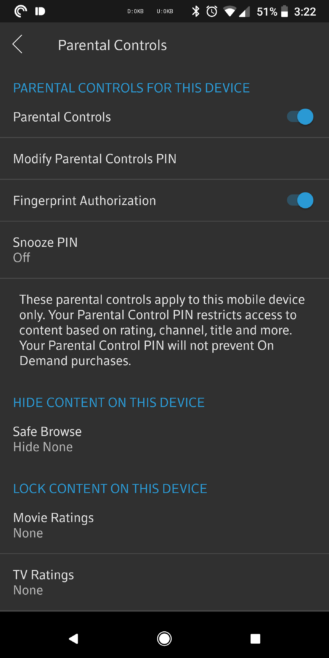 But here's something that might cheer you up: fingerprint authentication has been added for parental controls. Gain faster, easier access to your Parental Controls by using fingerprint authentication instead of a PIN. We’ve worked out a few code improvements and fixed some bugs to enhance your overall experience. Basically, instead of typing a PIN out every time, you can now control your parental controls with a touch of the fingerprint sensor. It's a small addition, one that can simply be toggled on and off, but it'll make life just a little bit easier. The update is part of version 4.9.0.027. If you can't update via the Play Store for whatever reason, we've got the XFINITY Stream APK over at APK Mirror.